Sweden's Trade Union Confederation, which represents over 1.5 million people working in the Nordic country of 10 million people, has proposed an apprenticeship program where unqualified immigrant workers would be paid low "wage dumping" salaries while gaining the requisite qualifications. In a complete policy reversal, the Swedish Trade Union Confederation (LO) has, in a new proposal, expressed that it favors lowering wages in a bid to revitalize Sweden's job market. It argues that if wages are lower, immigrants will have better job prospects. They've proposed that companies embrace an apprentice program whereby unqualified foreign-born "new Swedes" would enter the Swedish job market through what it calls "education jobs," the Swedish economic daily Dagens Industri reported. According to the proposal, newcomers to the job market will work while they obtain the right qualifications. In order to charm more employers with the new proposal, LO suggested lowering the wages of the workers concerned. The idea was hailed by the Confederation of Swedish Enterprise, as well as top politicians from the Social Democratic and the Conservative Parties. According to LO chairman Karl-Petter Thorwaldsson, the idea is to allow immigrants to enter the job market as neophytes and establish a career history before being paid at higher rates as trained professionals. In this connection, he called the notion of lowering wages "reasonable," noting that exact wage cuts would be negotiated by partners. The lower salaries would only be in place until workers obtained the right skill set. It was suggested that these apprenticeship periods would vary from industry to industry. The new initiative will primarily involve adult immigrants who a lack secondary education. According to LO, it will cover approximately 50,000 workers aged 25-45, targeting "new arrivals" in particular. Swedish Industry Minister Mikael Damberg said the government fully supported the proposal, which he hoped to become a reality soon. Elisabeth Svantesson, labor spokeswoman for the opposition Conservative party, welcomed LO's gambit, which bears striking similarities to the Conservatives' own policy. "Now it's up to LO and the Confederation of Swedish Enterprise to ensure that this plan becomes a reality," Svantesson said. In the last two years, Sweden, a sparsely-populated Nordic nation of 10 million, received over 200,000 asylum seekers, which has left a heavy toll on the country's welfare system and widened the employment gap. While unemployment among those born in Sweden is low and hovers around 4.3 percent, unemployment among those born abroad has reached 21.1 percent and continues to rise, the latest figures from the Swedish Employment Service found. 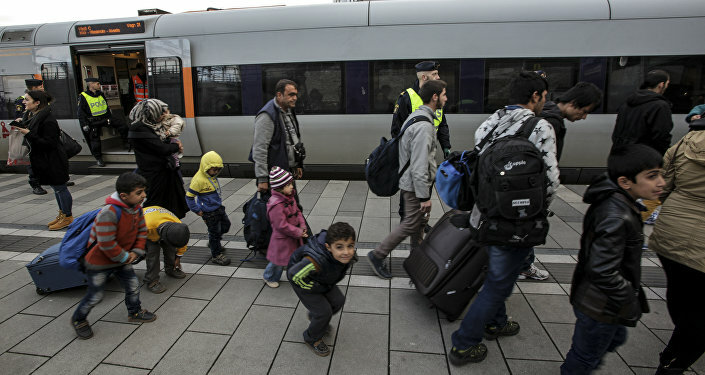 Before the migrant crisis reached its peak in 2015, Swedish politicians and mainstream media were eager to portray the influx of asylum-seekers as a "rain of competence," insisting that highly-educated professionals would be queueing to Swedish employment agencies. In particular, Swedish national broadcaster SVT notoriously reported about "thousands of full-educated engineers, doctors and economists" fleeing to Sweden. Later, the overjoyed rhetoric had to be tuned down, as the Swedish government itself had to concede that the delight was premature and to launch a program of menial jobs with almost non-existent qualifications in order to employ their unaccomplished "new professionals." In 2015, Swedish men had an average monthly salary of 36,600 SEK ($4,040), compared with 33,900 SEK ($3,745) for women.